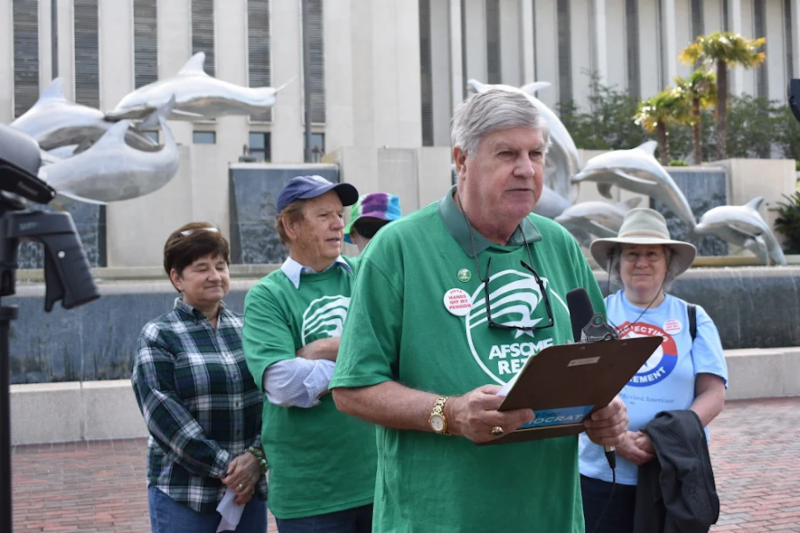 Retired workers blasted Rick Scott on Thursday for his self-serving politics and skirting the law by giving hundreds of millions of dollars in state pension business to campaign contributors. "This is just further evidence that Rick Scott is always and only looking out for himself as he has proven he'll play politics with our state pension system that so many hard working Floridians - our firefighters, teachers, first responders and state workers - depend on," said David Jacobsen, a retired state worker who is president of the Northwest Florida AFSCME (American Federation of State, County and Municipal Employees). The retired workers were responding to alarming new reports that two executives gave a total of more than $50,000 to Scott's political committee after he directed $250 million in lucrative state pension business to their firms. "Rick Scott is skirting laws that prohibit executives from donating to third party groups that support public officials, which is what this Super PAC does - while perhaps crafty, this just raises more questions and shows he'll do anything to get elected," Jacobsen said. Scott is skirting federal rules by the Securities and Exchange Commission (SEC) that "prohibits firms from receiving investment fees from public pension systems if their executives donate campaign cash to pension overseers like Scott. SEC officials aimed to prevent investment decisions from being shaped by political influence." "Over the last two weeks, we've learned more about Rick Scott's controversial Super PAC and the many conflicts of interests, as well as his secretive financial accounts, proving Rick Scott just can't be trusted," Jacobsen said. This week, Scott delayed revealing his finances, hiding his conflicts of interest from Floridians for even longer after hiding them for the last seven years, and dodged more questions Thursday about how he "had not offered meaningful disclosure about how he became $46 million richer while governor," according to Florida Politics. Scott shirking the law with state pensions is one of a growing number of financial scandals that have dominated the early days of his campaign including: him refusing to release his finances or detail his secret financial account that violates federal disclosure requirements; the campaign finance watchdog group End Citizens United has filed two FEC complaints detailing how he illegally coordinated with his Super PAC; and Scott's repeatedly ignored questions on the campaign trail about disclosing his assets. Scott is also facing an ongoing state lawsuit over his refusal to disclose his secret account. The Florida Democratic Party launched this digital clock to track how long Scott has been in the race while hiding his finances. "Rick Scott is a walking conflict of interest and this latest news is just evidence that Rick Scott could not be trusted as governor and certainly cannot be trusted as a U.S. Senator to look out for hard-working Floridians," Jacobsen said. "Rick Scott has hurt workers across the state and now, we learn that he used his role as governor to help out private equity investors, all in the name of furthering his political career." More information about Scott's financial scandals is available at SelfServingScott.com. "The Florida governor led a group that raked in cash from Wall Street firms after Scott's administration gave them pension deals." "A super PAC led by Florida Gov. Rick Scott raked in donations from two private equity executives after Scott's administration directed lucrative state pension investments to their firms, according to government records reviewed by MapLight and Capital & Main." "The donations were made to a committee that's now supporting Scott's U.S. Senate bid, despite a federal rule designed to prevent financial firms from bankrolling the election campaigns of public officials who oversee state pension investments." "A 2010 Securities and Exchange Commission (SEC) rule prohibits firms from receiving investment fees from public pension systems if their executives donate campaign cash to pension overseers like Scott. SEC officials aimed to prevent investment decisions from being shaped by political influence." "Scott, a Republican, began chairing the New Republican PAC in May 2017 and announced his former campaign manager would serve as its executive director. Soon after, the group received $5,000 from New Mountain Capital Chief Executive Officer Steve Klinsky and $50,000 from Energy Capital Partners founder Douglas Kimmelman." "The contributions flowed to the super PAC after New Mountain Capital and Energy Capital Partners received a combined $250 million worth of new investment commitments from Florida's state pension system in 2014 and 2015. Scott is one of three state officials who oversee the $160 billion pension system. During the most recent fiscal year, the Florida investments generated more than $3 million in fees for the firms."